This exterior view of MOAR is about as inviting as its stolid massing gets. The architecture conceals rather than reveals the building’s subject. 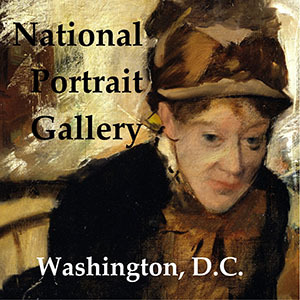 All photos courtesy of the Museum of the American Revolution. The United States was birthed in resistance, rebellion, and war. The story of the American Revolution, repeated, refined, and simplified over many generations, has become an iconic element of our national fable: our patriot “ancestors” resisted the tyranny of the greatest empire of its day, preserved American liberties, and established a novel kind of egalitarian republic. The catch-phrases of “the times that try men’s souls”–“life, liberty, and the pursuit of happiness,” “all men are created equal,” and “the consent of the governed”–still resonate in our political and cultural discourse. And yet the story of the Revolution is complex and messy, full of sharp elbows and glaring contradictions, including the persistence of slavery, the dispossession of Native Americans, tensions within the states, among the states, and between state and federal governments, and a tendency to advantage our elites over our masses. If ever there was a difficult, challenging story to tell, it is the story of our Revolution and its impact on subsequent generations, right up to the contemporary moment. In a sense, the story of the American Revolution, which is also the story of our first civil war, has always been contested and fraught. Left: Another view of MOAR exterior, with Declaration Preamble highlighted. 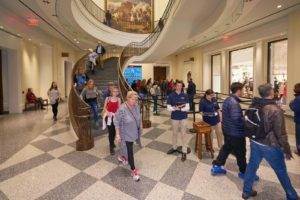 The opening of the Museum in April marked the conclusion of a fourteen-year effort. 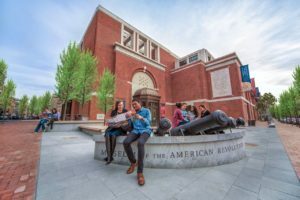 Starting with an important collection of artifacts amassed largely by the Valley Forge Historical Society, MOAR proponents had to find a site, raise the necessary funding ($120 million), design a building, and develop a large, complicated, multi-media exhibition. But these were not the only challenges faced by the new project. Located in a district densely populated with historic structures and monuments, MOAR needed to position itself in relation to neighboring sites of memory. MOAR also had to interpret its core collection, while transcending its limitations. 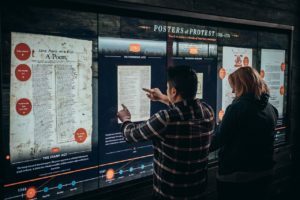 Another challenge was to convey the essentials of modern historical scholarship on the Revolution while providing an accessible, engaging visitor experience. Given this plethora of possibilities, how was the Museum to squeeze ten pounds of content into the proverbial five-pound sack? 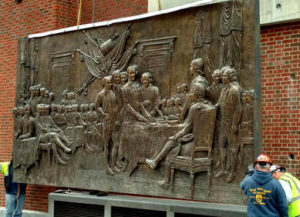 Right: Workmen install the large bronze of John Trumbull’s, Declaration of Independence at the entrance to MOAR. Left: The main circulation space with a stairway connecting the first floor with the second-floor core exhibition. One of the principal effects of devoting so much space to reception, circulation, and special events is that the core exhibition proper occupies only 18,000 square feet out of 118,000, crowded into sizable, but relatively constricted galleries on the second floor. Oddly, given the pressure on available space, the MOAR core exhibition features two openings and two codas! Most visitors will begin their tour by watching a timed introductory film on the first floor and then ascending the stairway to the exhibition galleries. But some impatient visitors, or those with limited time, will go right to the second floor, where a tableau with sound and light dramatizes the destruction of an equestrian statue of King George III in New York City in July 1776, symbolizing the rejection of British rule. (This signal event, incidentally, appears four times in the program–twice in media presentations and twice in full or partial tableaux.) The last gallery of the core exhibition proper offers a coda: composed of mid-19th-century photographic portraits of “the Revolutionary Generation,” (actually a stretch, since those depicted range over three generations) that help to propel the story toward our contemporary moment. This is followed by a second coda–a stand-alone multi-media theater that interprets one of MOAR’s most iconic objects–Gen. 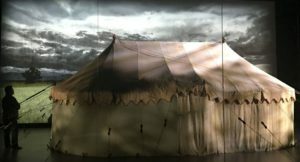 Washington’s headquarters tent. 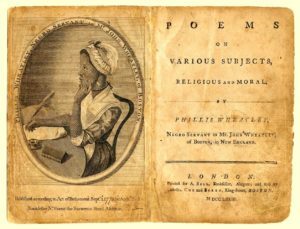 Right: This book of poetry by Phyllis Wheatley, an African American “servant” living in Boston, represents a consistent effort by MOAR to incorporate blacks, Native Americans, and women in its historical narrative. To carry its story, MOAR employs a variety of design modalities. Visitors move through a sequence of shaped spaces in roughly chronological order, punctuated by topical exhibits and displays. The exhibition begins with several galleries that trace the origins of the Revolution, leading to the American declaration of independence. The heart of the exhibition–about 60% of the gallery space–focuses on the Revolutionary War (1775-1783), in its military, social, and ideological aspects. And in the concluding galleries, visitors encounter issues and ideas from the end of the war through the adoption of the U.S. Constitution. 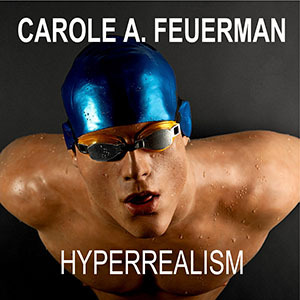 A number of tableaux with life-size figures focus attention on dramatic moments and figures. Audio-visual media include theatrical videos, sound and light shows, audioscapes, and a number of digital interactives. In several galleries, notably one featuring an overarching Liberty Tree and another dominated by a mocked-up ship that sailed as a privateer, visitors encounter evocative environmental elements. Both adults and children are invited to engage in active hands-on discovery, lifting lids, sliding panels, sitting in a period chair, or hefting a cannonball. Even the sense of smell is engaged–take a whiff of the tea like that jettisoned at the original Boston Tea Party! Encounters with original and replica objects, images, and texts are complemented with interpretive labels, timelines, over-size quotes (WORDS WRIT LARGE), and murals. Deployment of so many types of interpretive vehicles is designed to engage diverse audiences and to maintain a lively pace through a large, rambling linear exhibition. Every visitor is likely to encounter some element of the project that appeals to her or his sensibilities, learning style, background, or interest–but this will vary greatly from one visitor to the next. One colleague was moved by a tableau that dramatized the suffering of the Continental Army in late 1776; another enjoyed standing on the deck of the privateer. The one object that seems to fall flat for most everyone is Washington’s tent. 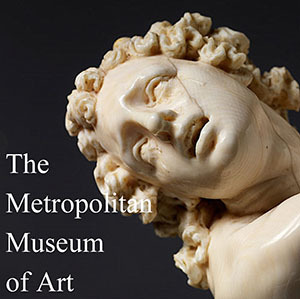 Though heavily promoted in the Museum’s publicity and marketing, this iconic object–restored with infinite care–is visible for only a minute, at a distance, at the conclusion of an informative but not viscerally gripping historiographic film that is shown in a stand-alone theater separated from the rest of the core exhibition. Conservation concerns may have mandated that this treasured object be exempted from conventional display, but one wonders if the tent–static, stolid, and mute–is worth the space and expense devoted to its veneration. 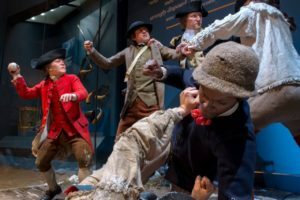 Left: Dramatic tableaux like this one, which depicts a brawl among soldiers in the new Continental Army, vivify regional differences even among those committed to the Revolution. MOAR’s core exhibition is densely layered with personalities, stories, and information. Anyone interested in covering every detail could easily spend a couple of days watching, listening, and reading. The language used throughout the core exhibition is generally clear and sensible; in a few instances, the language rises to the level of poetry. However, there are also a few instances in which meaning and implications are obscured. One of the most egregious of these occurs in a sequence of four text panels that present differing viewpoints on the issue of independence–seen from the perspectives of the British, the Revolutionaries, the Loyalists, and a miscellany of “those in between.” Calling out Native Americans and African Americans as well as neutrals helps to foreground two substantial, significant populations (250,000 and 400,000 respectively) but does a disservice to the far more numerous and salient neutrals, estimated at a third or more of the colonists of European descent. Other telling stories and events are buried deep in digital interactives, where they are unlikely to be accessed by the typical visitor with tired feet who is already suffering from information overload. Still, the MOAR core exhibition succeeds in melding a good deal of sound historical knowledge with a veritable lexicon of contemporary exhibition techniques to tell a complex and sometimes challenging story. In fact, without a lot of fanfare, the MOAR exhibition is actually subversive and, in some aspects, complicated and nuanced. For one thing, MOAR tells a self-consciously inclusive tale. 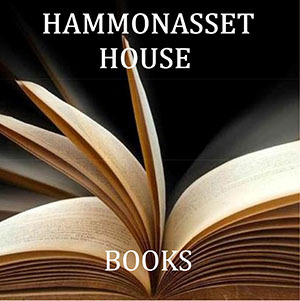 This is not just about the Founding Fathers–though they are here–but a story about the ordinary folk who populated the American colonies (and later states) from 1763 to 1790. Women move closer to the foreground in the Museum’s core exhibition: they appear not just as wives and mothers, helpmeets and camp followers, but as polemicists, boycott leaders, business proprietors, and even as spies and (disguised) soldiers. Native Americans–often the forgotten people in the Revolutionary story–come on stage as important actors, historically and symbolically, as the Revolution unfolds. But most importantly, we find African Americans at center stage. Many are slaves, but others are free–and they are diverse in age, gender, occupation (from field hand to poet), region, and attitude. The representation of men of European origin also encompasses diverse circumstances and perspectives, but they are no longer the sole characters in the narrative. By presenting a multitude of viewpoints and choices, the core exhibition offers an unusually complex and messy story. It is also a generally detached and non-judgmental narrative: Loyalists are presented as patriots who chose to remain committed to the Crown and to British liberty; the British and Hessian soldiers are shown as professionals doing their duty rather than as bloodthirsty monsters; both the British and American leaders are shown as rational (if often mistaken) in their policies, dedicated to principle and differing ideas of liberty, caught up in a struggle that transcends their immediate concerns and ultimately extends around the globe. There is still a celebratory element of David versus Goliath in this storyline and George Washington is treated as something of a demigod, but it is refreshing to encounter Revolutionaries debating Revolutionaries on issues like independence; to discover people changing sides (sometimes repeatedly) as military power ebbs and flows around them; and to learn that a substantial proportion of the European colonists tried to put their heads down and to remain neutral, content to tend their gardens amidst the cauldron of what became a violent civil war. Throughout, the MOAR exhibition emphasizes the ideals of the Revolutionaries. “All men are created equal” and “life, liberty, and the pursuit of happiness” are recurrent tropes. But MOAR also addresses–sometimes directly and forcefully–the contradictions inherent in a revolutionary movement that spoke of freedom, equality, and the consent of the governed but denied freedom to black slaves, justice to Native Americans, and the franchise to women and the poor. The legacy of the American Revolution emerges as more problematic than we often recognize and we begin to see that the failures, as well as the achievements, of the Revolutionary generation are still playing out in the contemporary moment. Left: Displays of period weaponry, while not as prominent as one might expect in an exhibition devoted to armed revolution, are an important (and static) feature of the MOAR narrative. Like the Revolution itself, the MOAR core exhibition has its flaws, as interpretation and as experience. The most obvious of these stems from the Museum’s origins in the collections of the Valley Forge Historical Society. These resources ranged from George Washington’s headquarters tent to bits and pieces of miscellaneous memorabilia. But the core of the collection consisted of objects–arms, uniforms, flags, and equipment–of the Revolutionary army and militia. Despite heroic efforts to broaden the scope of material culture and hence the scope of the historical narrative, the core story still focuses most heavily on the military history of the Revolutionary War. The creation of the American Army may well have been an avatar of the American nation, but the two–intricately linked–are not the same thing. 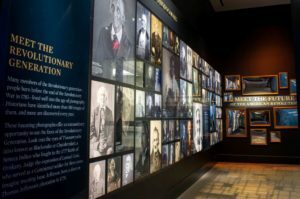 The exhibition acknowledges this distinction, but some of its most expensive and striking exhibits–notably life-size figures, tableaux, and a re-created privateer–relate directly to the military theme. Together with displays of arms, these elements overshadow elements devoted to the sociology, ideology, and politics of the Revolution. The military dimension of the Revolutionary War takes pride of place over its revolutionary origins and implications. Despite its emphasis on the military history of the Revolution, the core exhibition is remarkably devoid of violence–physical and psychological–and its consequences. “The violence of imperial oppression collided with the violence of colonial resistance,” writes Holger Hoock, in a war that produced proportional casualties larger than any other American conflict except the Civil War. Between 6,800 and 8,000 revolutionaries died in battle; 10,000 died from disease, cold, and malnutrition; and an estimated 16,000 died as prisoners; 20,000 British died, along with thousands of American Loyalists, Native Americans, Germans, and French. Many others were wounded and maimed. Both sides in the struggle used terror tactics to cow their opponents, with threats, bullying, confiscation, and other forms of coercion. As a result, the rhetoric of violence competed with the rhetoric of rights as both sides deployed personal accounts, paintings, and cartoons to document their victimization and the savagery of their opponents. In an age when bloodshed and violence is rife in movies, television, video games, and literature aimed at children and adolescents, it is surprising that MOAR is so reticent about the violence, blood, and horrors of 18th-century warfare–what one soldier termed “the uncommon Spirit of Murder & Cruelty.” A sound, light, and motion show immerses visitors in the “field of battle,” but this comes off as loud, but relatively bloodless. A few scattered references, however vivid, fail to convey the scale of violence and destruction that bedeviled the survivors and the nation for a generation after hostilities had ended. Above: “Field of Battle” is the most prominent and potent effort to suggest the bloody violence of the Revolution. 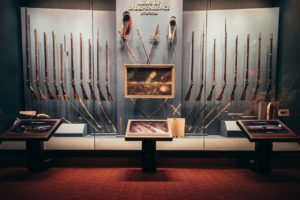 Visitors are confronted with the sounds and smoke of musketry–and witness the (sanitized) casualties of 18th-century battle. This indifference to violence percolates into the exhibitry, often in puzzling ways. A small exhibit devoted to the subject of confiscation features furniture from the home of the Drinker family of Philadelphia, suspected Loyalists, which was seized by local patriots. The inherent violence of such an act could easily have been dramatized by displaying a jumble or pile of confiscated furniture at the moment it was being taken from the family home. Instead, the furniture is displayed intact (if in slight disarray) against a sedate, refined Georgian interior. An even more egregious and puzzling instance of historical amnesia is the gallery devoted to a debate among the Oneida Indians about whether to ally with Great Britain or the American Revolutionaries. This is one of the largest and most dramatic spaces in the entire core exhibition (bought and paid for with a $10 million gift from the Oneida Nation). 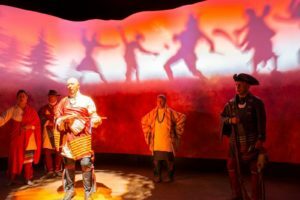 Life-size figures are animated with a compelling sound and light show that makes clear the quandary and the choices that confronted the Oneida people. In the end, the Oneida, almost alone among the Native American groups east of the Mississippi, chose to side with the Americans. At the conclusion of the debate, a montage of photos shows members of the Oneida tribe who have served in the U.S. armed forces over the generations, underscoring their continuing devotion to the new nation. Right: The Oneida, one of the six nations of the Iroquois Confederacy, debate the wisdom of allying with either the colonists or the British in a dramatic sound and light show. What goes unnoted, however, is the steady disaffection of the Oneida as the war went on and their unhappy fate at the hands of the Americans after the Revolution: despite their commitment to the rebel cause and treaties with New York State (1784) and the Federal government (1794) that granted the tribe six million acres in New York State, the Oneidas’ ancestral lands were steadily reduced to a mere 32 acres! The Stockbridge Indians, who were early supporters of the Revolution and who were the first Native Americans to be granted U.S. citizenship, were rewarded for their loyalty by a comparable diminution of their lands in Stockbridge, Massachusetts. Neither catastrophe is called out in the core exhibition. Omissions and elisions are common features of all historical narratives: forgetting is as important as remembering in shaping memory, for both individuals and nations. Selection is also essential to maintain focus and to avoid being drowned in details and digressions. But one omission stands out, because it concerns the Saratoga campaign that is generally considered to be the turning point of the Revolution. In the MOAR core exhibition, British Gen. Burgoyne’s campaign south from Lake Champlain toward Albany–a movement designed to cut New England off from its sister colonies–is given modest space on a side wall of a gallery that projects maps of various campaigns unrelated to Saratoga, a huge display of Revolutionary-era firearms, and the entrance to an immersive sound, light, smoke, and motion show. The Saratoga campaign is given over mostly to quotes by the wife of the Hessian commander, which reveal nothing of the battle’s strategic importance and consequences, among which was France’s formal alliance with the new American states. Gen. Horatio Gates, the victor at Saratoga, is represented by a portrait (one of the few military figures who are permitted to encroach on Gen. Washington’s territory). The only effort to explain the course of this critical moment is a map that is literally unintelligible–one of the worst graphics I have ever encountered in a museum. Unless you were versed in the military history of the Revolution, you would have no idea how this campaign unfolded or why it was pivotal. Left: Washington’s headquarters tent is probably the most iconic object in the MOAR collection. Its display, however, partly due to conservation requirements, is unfortunately static. Unfortunately, the answers provided here are partial at best, misleading at worst. 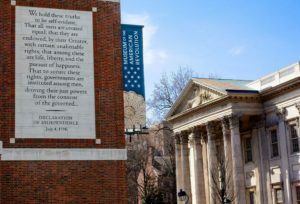 For a generation of Americans locked in constant struggle over fundamental interests and ideals, the meanings of the American Revolution are contested and the outcomes of those contests could shape or re-shape the nation’s future. We need to see and understand the circumstances that led to the Revolution, the choices made by the Revolutionary generation, and the consequences of those choices for our own times. We need, in short, to learn as much as we can about contingency, about individual and collective agency, and about the provisional nature of even our most cherished ideas and institutions. And we need, as much as we can, to avoid concealing from ourselves our motives and the outcomes of the choices we have made. And here I would offer a fundamental critique of the core exhibition. 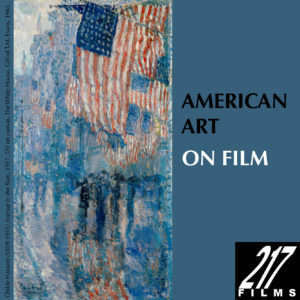 The MOAR exhibition is innovative in much of its content and it exemplifies what might be deemed best practice in current exhibition design and production, but it is already a dated construct and interpretation. History is a dynamic process; interpretations are constantly changing; our contemporary demographics, economy, technologies, and culture are transforming, even as I write. This means that the questions we deploy to interrogate the past are emergent as well; it is, after all, the changing questions that feed the development of new methodologies and new story-telling techniques. Right: A display on the Future of the American Revolution, inside the Museum of the American Revolution in Philadelphia, PA. Yet the MOAR core exhibition narrative is largely fixed. Objects can be swapped in from time to time and new stories can be incorporated in text or digital formats. But virtually nothing substantial in the exhibition can be altered or updated, without a significant–and probably unsustainable–investment of time, resources, re-conception, and radical physical revision of the current installation. We are left with a static show about a transformational movement, when what we need in our own rapidly changing time is an agile, experimental design that mirrors its subject. The American Revolution, with its legacy of ideals, institutions, flaws, and failures models for us the significance of contingency, human frailty, and change in history. Two cheers for the American Revolution–and two more for this important but uneven exhibition. Thanks to R. Scott Stephenson and Alex McKechnie of MOAR for providing information and images and to Sharon Holt, Carl Siracusa, and Ken Yellis for their critical review of draft text. Of course, I am solely responsible for the opinions expressed here–and for any uncorrected errors that may remain.